Honour guards march during the National Day celebrations in Taiwan. With a head of grey hair and a pair of gold-rimmed glasses, the casually dressed Chen Fu-men looks like a grandfather next door. But in intelligence circles on the two rival sides of the Taiwan Strait, he is a well-known figure. Chen's involvement in the killing of a Taiwanese-American author 35 years ago shocked the United States, which angrily demanded that the self-ruled island hand over Chen and two others to the American justice system. The assassination also became one of the triggers for democratisation on the self-ruled island, which had been under authoritarian rule by Chiang Kai-shek and his son Chiang Ching-kuo since 1949. The author, Henry Liu, 51, a Taiwanese journalist who moved to the United States in 1967 and later became an American citizen, had published an unflattering biography of Chiang Ching-kuo and was an outspoken critic of Taiwan's ruling party. Powerful officials in Taipei also believed that he was spying for the mainland. In 1984, vice-admiral Wang Hsi-ling, the head of the island's Military Intelligence Bureau, ordered his deputy Hu Yi-min and his top aide Chen to kill Liu, according to Chen. Chen asked the leader of Taiwan's notorious Bamboo Union gang, Chen Chi-li, to eliminate the journalist. In October, he and two other gangsters gunned down Liu in the garage of his northern California home. The murder rocked the US, and its relations with Taiwan dropped to their lowest point after a furious State Department accused Taipei of sending killers to assassinate an American citizen. The FBI was involved in the search for suspects, and through a tapped phone traced a conversation between Wang and Chen Chi-li. Taiwanese authorities later arrested the gang leader and his aide. Threatening to cut off arms sales to Taiwan, Washington demanded that Chiang Ching-kuo's government extradite the suspects to face trial in the US. The Chiang government finally allowed the FBI to question the three intelligence officials in Taiwan. In early 1985, the three officials and the two killers were given jail terms in Taiwan. Wang, the gang leader and his aide were sentenced to life, and the two officials got six-month terms for their roles in the killing. Wang and the two gangsters were released six years later, while Chen Fu-min and Hu Yi-min were freed in late 1987. The bureau officials' collaboration with gangsters proved an embarrassment to Chiang, and his government grew concerned that the US might reappraise its policy of helping defend Taiwan. Though Washington had switched diplomatic recognition to Beijing from Taipei in 1979, it also enacted the Taiwan Relations Act to supply arms to Taiwan in its defence against Beijing. Beijing has threatened to use force to bring the island back into the fold since Chiang Kai-shek and his Nationalist, or Kuomintang (KMT), forces retreated to Taiwan after losing a civil war to the Chinese Communists in 1949. "I was just doing my job," said Chen, 79, a former deputy director of the Military Intelligence Bureau unit responsible for gathering intelligence about China since 1949 and keeping track of Taiwanese activities in the US. In an interview with the South China Morning Post, he said they decided to "bring justice" to Liu because they had solid evidence that he was spying for Beijing while also receiving monetary rewards from the bureau. "It had nothing to do with the book critical of Chiang," he said, adding when the FBI sent its agents to Taiwan to question them separately, he realised Liu also was an FBI informant. He said at the time that what Liu did was considered an act of treason by the bureau, which had a long-time practice of executing people considered to be traitors without needing the permission of top authorities. But after Helen Liu, the journalist's widow, filed a US$250 million (S$340 million) lawsuit against Taiwanese officials and former military leaders, the Chiang government paid her nearly US$1.5 million. News reports said after the killing, Chiang, who died in 1988, made changes that included banning the bureau's illicit execution practice. In 1987, he ended Taiwan's long-time martial law, which eventually led to the island's democratisation. Chen said after he was released from jail, he returned to the bureau and served as a unit deputy director until his retirement in 2000. Asked how he became a military intelligence officer, Chen said his father had been an agent working for the KMT government on the mainland fighting against the Japanese invasion of China in the 1930s. "I was taught to keep a low profile since childhood, and I still remember that whenever we moved to a new place, my dad would ask me to tell others that our surname was Bai or Wan instead of Chen," he said. He said that after moving to Taiwan with his father he studied at a maritime college in Kaohsiung and after graduating worked as a seaman. "Himself a secret agent, the captain of the ship I worked for one day asked me if I wanted to join the intelligence service, and he introduced me to study at a military intelligence training class in 1962. 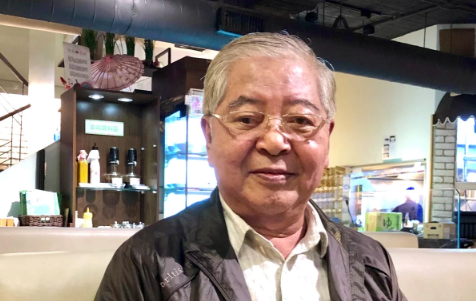 In 1968 I was assigned to receive outfield training in the border of Yunlin and Burma for three years," Chen said, adding that at that time, the border was one of the major intelligence-gathering locations for both Taiwan and the United States. "We were the second and the last group to receive training there, and three of the five in the first group were killed during their missions," said Chen, referring the fierce espionage war that has been waging across the Taiwan Strait since 1949. "Actually, the ongoing cross-strait espionage war is as deadly as that of the real war," he said. Chen said Taiwan's intelligence warfare had gone through three periods, which include sending formal and informal agents to the mainland during the presidencies of Chiang Kai-shek and Chiang Ching-kuo from 1949 to 1987 as part of the KMT government's plan to recover China. As much as the KMT wanted to recover the mainland, the Chinese Communists were eager to bring Taiwan back into the mainland fold. "In this period, more than 100,000 people were killed or arrested, including thousands of those who did not follow the KMT forces to retreat to Taiwan and were asked to remain on the mainland as secret backups in the event of a KMT re-attack," Chen said. The second period involved the lure of Taiwan's freedoms plus financial rewards to absorb key people from the mainland to spy for Taiwan during the presidencies of Lee Teng-hui and Chen Shui-bian, from 1988 to 2008. "The Tiananmen incident, which saw the mainland crackdown on the pro-democracy students in 1989, helped facilitate Taiwan's absorption of mainland Chinese who opted for freedom and democracy," Chen said. But this was also the time when a number of Taiwanese officers, including Lo Hsien-che, a former major general with the bureau, were recruited to spy for the mainland, Chen said. "In addition to attractive monetary rewards, the sharp ideological differences between the KMT and the independence-leaning Democratic Progressive Party governments have made some people confused," Chen said. "People, especially those from the military who had been brought up with the loyalty concept towards the Republic of China, might become confused when all a sudden they were asked to serve for the government advocating independence." Both Lee and Chen were known for their pro-independence stands and opted for ditching the island's official Republic of China title, referring to it as merely Taiwan - a stand sharply different from the KMT's belief that Taiwan is a part of the ROC. When Ma Ying-jeou of the KMT served as president from 2008 to 2016, he adopted a policy of engagement with Beijing, resulting in a warming of cross-strait relations. "During this period, the Ma government sharply cut back on espionage activities, changing the originally active offensive tactics into defensive," Chen said. "Now our intelligence work is to look for signs of possible attack from the mainland," Chen said, adding that along with sharing information with the US, Japan, and other neighbours as well as using satellites and other hi-tech means to monitor mainland military movements, Taiwanese agents now mostly recruit mainland students either studying abroad or in Taiwan as well as mainland women married to Taiwanese men. Since they were not formal intelligence personnel, the agents' main function was to observe if there were any major mainland military movements and send the information to their Taiwanese contacts, Chen said. "Actually, the mainland side is doing the same thing, making use of Taiwan's permission for mainland students to study on Taiwan by absorbing some of those students, or recruiting mainland-based Taiwanese students or businessmen to spy for them," Chen said, adding governments throughout the world would never ceased using the tactics of espionage. Chen said Taiwan once had the upper hand in its espionage war with Beijing after it recruited Liu Liankun, a major general in the People's Liberation Army (PLA) who was the most senior officer to have spied for Taiwan in the 1990s, but it was undercut by his accidental exposure by then president Lee Teng-hui. To intimidate Taiwan and discourage voters from supporting Lee, whom Beijing has regarded as a pro-independence activist, the PLA launched a series of missile tests outside Taiwan as the island was holding its first direct presidential election in 1996. In a bid to pacify the jittery public and using intelligence provided by the bureau, Lee declared that the missiles had no warheads and that there was nothing to be afraid of. At the height of the tensions, the US sent two aircraft carriers into the Taiwan Strait to warn the PLA against any missteps, according to American and Taiwanese government reports. Liu, who had supplied much valuable information to Taiwan - including Beijing's purchase of warplanes and missiles from Russia, its military deployment from coastal areas to the South China Sea and border of India, and British plan for the handover of Hong Kong to China in 1997 - was arrested in 1999 and executed by lethal injection in Beijing. Also executed was senior colonel Shao Zhengzong, who spied for Taiwan and built a connection between Liu and the island. "Soon after Lee revealed that the missiles were unarmed, then mainland president Jiang Zemin ordered that the secret informant be nailed at all costs as the dud missiles were supposed to be top secret and only those involved were able to have that information," Chen said, adding that with the help of a double agent - Major Lee Chih-hao, who worked at the intelligence bureau - the PLA eventually identified Liu and Shao. More than 200 PLA officers were investigated and 30 arrested, including Liu's son, who was sentenced to 15 years in jail, Chen said, adding that Taiwan's major espionage network on the mainland was also compromised. "When Liu was arrested, we knew nothing about it until after we sent our trafficker Yang Ming-chung to Shanghai to try to contact him," Chen said. But after failing to do so, Yang sensed that something might have happened and tried to return to Taiwan. He was arrested at the airport, he said. "It was only then that we knew our major network on the mainland had collapsed and our biggest asset [Liu] was down," Chen said, adding that Yang was subsequently sentenced to life in prison. But the lesson did not keep Lee's successor tight-lipped. In 2003, when Chen Shui-bian of the DPP was president and proposed to hold a so-called defensive referendum to win support from pro-independence voters, he revealed that the PLA had been aiming 496 missiles at the island and that all Taiwanese must unite to guard against the mainland. "The mainland was shocked to conclude that the Chen Shui-bian authorities must have had a reliable tip-off to know the exact number of missiles, and after an internal inquiry, it cracked another intelligence network and arrested a number of Taiwanese businessmen as well as a senior PLA officer," Chen Fu-men said. From then on, Taiwan's once active intelligence networks were virtually uprooted from the mainland, and to avoid losing more people, Taipei sharply cut back on sending bureau agents to the mainland, he said. Yang, 62, was released on January 23 after serving 20 years in jail. "His case is worth noting as it marked the downfall of Taiwan's secret intelligence warfare and put the island's espionage capability on the defensive," Chen said. He called on the government to restore Yang's military rank and its accompanying honour before his scheduled retirement. "He sacrificed his best years serving 20 long years in jail for the sake of Taiwan, so the government must at least grant him that," Chen said. Asked if he knew how many Taiwanese spies, formal or informal, were still serving jail terms on the mainland, Chen said: "As far as I know, there are still about 100 there." Now president of a civic group helping retired secret agents and families of those who died during their missions, Chen owns a restaurant in Taipei and has hired a number of those people. "I want to devote my time fighting for the rights of the retirees and families of those sacrificed in the missions because I understand how they feel," he said.